From Birdie: I have been to Arizona briefly, but not long enough to enjoy all of its different scenery. I designed my quilt in EQ6 and from there figured out how to sew the pieces on-point to represent mountains. The colors also speak to me of Arizona, or at least the Southwest. The quilt top is made with batik fabrics. Note: Birdie used a quilt block from Quilter's Cache at the center of her quilt, placing it on-point and surrounding it with her own border designs. 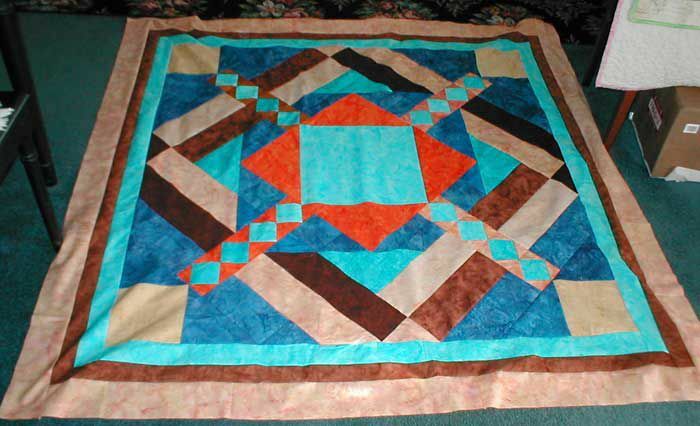 From Donna: My love of polychrome-colored Acoma Pueblo pottery inspired this 64-inch by 74-inch quilt. When I saw J. Michelle Watts' fabric line, my pottery collection came to mind and the designing began. From Betty: This quilt challenged me to sew my first needleturn applique quilt with metallic thread embroidery. It is a 23-inch by 30-inch wall hanging that will hopefully hang in our next Arizona home. After this winter in Minnesota, I am ready to move! From Grace: This quilt was created to use as a Christmas present for my cousin. I used bright bold colors that worked perfectly together and it is more stunning in person. I followed the Through the Windows Quilt Pattern but assembled it with rotary cutting and quick piecing instead of paper piecing techniques. From Kay: My quilt was inspired by Janet Wickell's Through the Windows quilt design. I already had most of the fabrics in my stash, because I've been collecting fabrics featuring Kokopelli and in southwest colors. My quilt top measures about 43 inches by 48 inches. From Carol: We have a really large wall in the Great Room and had been searching for the right showpiece to hang on it. Our decor is Southwestern, with landscapes and colors that I love even though I live in Manitoba, far away from that setting. I've been a quilter for only five years, so at first I did not feel confident enough to create a wall quilt for the area, but after years of looking at the empty wall, I decided to try. The result is a 6-foot by 8-foot creation that combines paper piecing and other quilting techniques as well as 3-D embellishments. From Sue: I made this quilt after my dad passed away. He loved to take photos on his many trips to various places, and the quilt was designed to represent one of my favorites, a photo that he took in Monument Valley, Arizona. I was just learning how to quilt when I made this and took a class at our local community college. One of our assignments was to create a landscape quilt, and since dad had just passed and I had this exquisite photo, I decided it was the perfect choice for my project. Jayne decided to sew the Darting Birds quilt pattern in Southwestern colors. The quilt block worked perfectly for this theme.